Why Can’t We Live Longer? Everyone wants to live longer. It is one of the most deeply rooted instincts of mankind. Everyone wants to live a life of usefulness and abundance, free of disease and unhappiness. As we grow older, we look forward even more anxiously to increasing our lifespan. We want time to enjoy our achievements, time still to make plans. These golden years are ours because of advances made by tireless research in medical science. They represent a decisive victory over the contagious and infectious diseases which sometimes wiped out whole sections of the world’s population many years ago. Thanks to the knowledge provided by years of research, many diseases such as diphtheria, scarlet and typhoid fever, syphilis and – and to a great extent – tuberculosis. we no longer need fear the ravages they once inflicted worldwide. All these pestilences, however, were caused by those invisible but ever-present enemies of health – germs. A single, fundamental disease of the human body can now be held accountable for much of the illness and more than half of all deaths occurring each year in the United States and Europe It is a disorder known by the general term of arteriosclerosis, which means a hardening and thickening of the arteries. It became so widespread that Dr. Paul Dudley White, a noted heart specialist, who died in 1973, once described it as “a modern epidemic”. As the disease progresses – sometimes over a long period of time – the vessels that carry the blood from the heart to the body’s tissues become stiff, and their inner surfaces roughened and thick. These conditions lay the groundwork for the three most common causes of death and disablement in the western world: heart attack, heart failure, and stroke. Is there anything that can be done to reduce atherosclerosis and vanquish this number one killer, whose favorite victims are men in their middle span of life, and even the very young, sometimes those in their twenties? The answer is “yes” – provided you will take the time and the trouble to learn a few simple rules. Take diseases of the heart and blood vessels, for example. Terms such as atherosclerosis, coronary thrombosis, and cholesterol are today fairly commonplace, even in publications for the general reader. But how many people know exactly what these words mean? The Cause Of This Epidemic? The arteries are the vessels that carry fresh blood from the heart to the billions of cells in our bodies that are in constant need of nourishment. Upon careful examination, we find that the arteries are not the simple tubes we have pictured them to be. We can see that their structure is more like that of a garden hose, containing three layers of tissue in the walls. This diagram shows the three coats of the coronary artery and the channel through which the blood flows to nourish the heart muscles. The inside layer or lining of the artery, which doctors call the intima, consists of a slippery membrane somewhat similar to the mucous membrane on the inside of your mouth. The in-between layer, known as the media, is formed of muscle fiber. This enables the blood vessel to expand and contract with the heartbeat, to facilitate the flow of blood through it. The outer layer, called the adventitia, is composed of coarse strong fibers which provide added strength to the artery. In both the outer and the intermediate layers, there are tiny intrinsic blood vessels which nourish the artery itself. The thickness and exact composition of the three layers vary, depending upon an artery’s size and location. There are, however, two kinds of hardening of the arteries, known by the general term, “arteriosclerosis,” which means hardening or thickening of the arteries. One occurs when calcium deposits in the middle layer of the artery causing it to become brittle and hard. sometimes called a “pipestem” artery. Such calcification does not necessarily obstruct the blood flow, and is usually harmless from a clinical point of view. The other type of change – and it is the more frequent one – has serious consequences. It consists of a thickening of the inner wall of the artery by deposits of fats: cholesterol (a fatty alcohol), fatty acids, and the like, together with calcium. This diagram shows the three coats of the coronary artery and a partially blocked channel through which the blood flows to nourish the heart muscles. As these deposits grow, the passageways or canals of the arteries become narrower, much in the same way as the drain from your kitchen sink becomes clogged with grease deposits. The result is that less and less blood can flow through the narrowed opening to the tissues or organs that depend on it for life. Your “pipes” have become clogged. At the same time, the swelling of the lining cells and roughening of the inner surface provide sites for formation of blood clots inside the narrowed artery. If the blockage is complete in vital arteries that feed the heart muscle, a heart attack or, as it is termed medically, a coronary thrombosis occurs. If this disaster occurs in the cerebral arteries of the brain, a “stroke”, sometimes called a heart attack in the head, results. When the small arteries of the kidneys are affected, Bright’s Disease, formerly called “dropsy”, and other diseases ensue. But whether the thickening and blocking process takes place in the heart, head, or kidneys, it is essentially the same disease. Doctors refer to it as atherosclerosis. Over a century ago, during an autopsy, a German pathologist named Rudolph Virchow laid open an artery to examine its interior wall. Along the lining he observed deposits of mushy fat that he called atheromata, a Greek word meaning “porridge.” It was from this word that the term, atherosclerosis was derived. Embedded among the cells of the artery wall along with the fat, Virchow observed some glistening crystals. These turned out to be cholesterol. But how did these fats get into the artery walls? This theory was eventually supported by the discovery that these fatty deposits, especially cholesterol, exist in the same proportion in the artery wall as in the bloodstream itself. There have been many theories advanced over the years on how fatty deposits get into the artery wall but. in addition, there are other factors that can influence the individual’s susceptibility to atherosclerosis, or death from a heart attack or stroke. These include such things as inherited or constitutional factors, and the coagulating ability of the blood. However, regardless of all the theories, whether proven or not, one causative factor that stands out continuously above and beyond all others, important as they are, is fat in the diet. And it is this factor that can be controlled. The exact relationship between the amount of fat you eat and the production of cholesterol in your body is still a very complex question and researchers differ on some points. But there is one aspect of the problem that all are agreed on: the cholesterol found in the blood is made largely in the liver from fats in the diet. It is also believed that cholesterol is produced in the arterial walls themselves, but the main source and the one that we can, to a great extent control, is fat in our food. It is a well documented fact that in countries where most of the diets are low in fat there is a notable scarcity of heart attacks and strokes due to atherosclerosis compared to countries where diets high in fat are regularly consumed. See: The Mediterranean Diet. Does Heredity Have Anything To Do With The Problem? You may by now be now be wondering: why do some people have more cholesterol in their blood than others? In answer to that question there doesn’t appear to be a “one answer fits all” solution. However, it is known there are other predisposing factors. One of them is heredity. Some families are affected by what physicians call hereditary familial hyper-(excessive) cholesteremia. In such a family the tendency to high levels of cholesterol in the blood is passed on for several generations and it is usually found, among members of such families, a large number of individuals who suffer heart attack and strokes. 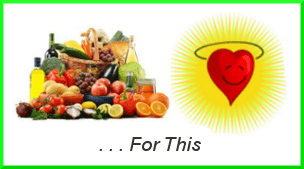 Although we cannot choose our parents, we can, and it is never too late, to choose our diet. By learning how to avoid food high in fat and cholesterol content, we can help minimize the effect of heredity. If no heart attacks or strokes have occurred in your own family line, you have at least one protective factor in your favor from the beginning. The second factor is one that is pretty much up to you. It concerns what you eat and how much you eat. Mainly, select a diet that will keep your blood fats down to normal levels, there is now irrefutable evidence showing that excessive fat in our diets can lay the groundwork for heart disease. Unless there are genetic problems there is one other factor, apart from atherosclerosis, that is also a major cause of heart attacks: Smoking. 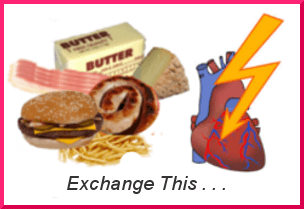 Together with excessive fat in your diet they make a formidable force in attacking your heart and arteries. How do you combat this threat? If you smoke, STOP ! Stop smoking, take care of your diet and your heart will take care of itself. The contents of this post is for information only and not meant to offer advice on any weight, fitness, or health problems you may have. If you have a weight or fitness problem, or feel you have a health problem, always seek the advice of your medical practitioner or a suitably qualified health professional.